§A Gunnulfr and Eygautr/Auðgautr and Áslakr and Hrólfr raised §B this stone in memory of Fúl, their partner, who died §C when kings fought. The design on the third photo looks very much like the one on DR 314 in Lund, Sweden, and perhaps also on Vg 106 in Karleby, Sweden. 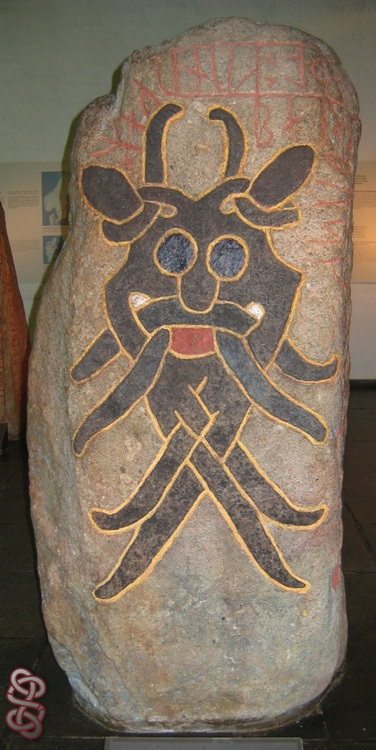 It's one of several rune stones standing in Moesgård Museum, and I got the photo from my friend Ogneslav.... Thanks !